Matt mentioned to me last week that there was a recipe for beef & stout pie in the William-Sonoma catalog that sounded good. I took a look at it & decided I could make a version of it using what I had around the kitchen. Basically, I made a beef stew using ground beef instead of cubes of beef. I bumped up the amount of vegetables in comparison to the original recipe & added some beets. 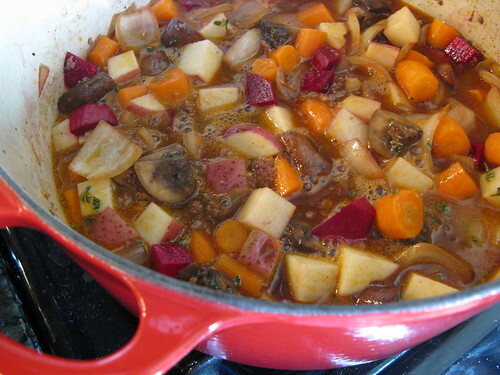 The meat & vegetables are stewed in beer instead of stock giving the gravy a nice rich flavor. The thing that really makes this dish special though is the crust which is a basic pastry dough with blue cheese folded into it before topping the stew. This was the perfect dish for a cool fall night. Matt loved it & said of all the versions of beef stew I've ever made this was his favorite. His only complaint was he wanted more of the crust. I have to say in the past when I've made pot pie I've used a pre-made Pillsbury pie crust (pastry intimidates me) but this time I decided to just go for it. Matt said it was much better than the store bought version, especially the flakiness. Next time I'll cut any excess pastry into strips, bake them with the pot pies & serve them on the side. Heat 1 T of olive oil in a large soup pot over medium-high heat. Add the mushrooms & onions. Season with salt & pepper & cook until soft about 10 minutes. Remove from the pot & set aside. Add the remaining 1 T of olive oil to the pot & heat. Add the ground beef & cook until throughly browned. Remove from pot & set aside. Add garlic & tomato paste to the pot & stir for about 30 seconds. Add the bottle of beer & scrape up as much of the brown bits on the bottom of the pot as you can. Return the beef, mushrooms, onions to the pot. Add all remaining vegetables & thyme. Bring to a boil. Cover & reduce heat. Allow to simmer for 3 hours stirring from time to time. Combine the flour, salt & sugar in a food processor, pulse to blend. Add the butter & pulse until the mixture is a course meal. Add 1/2 cup of the water & pulse a few times. The dough should now come together when you squeeze it but not be sticky. If it is too crumbly still add more water 1 T at a time, pulsing inbetween additions, until it comes together. Turn the dough out on to a floured surface & form into a disc. Cover in plastic wrap & chill for 1 hour. 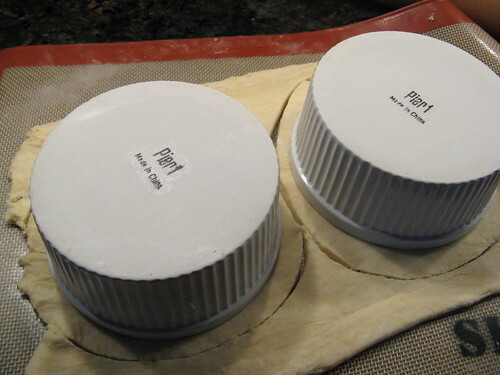 Remove the dough from the refrigerator & put on a floured surface such a silicone mat or cutting board. Lightly flour the top of the dough. Roll the dough out to an 8-inch square. Crumble the blue cheese over half of the square. 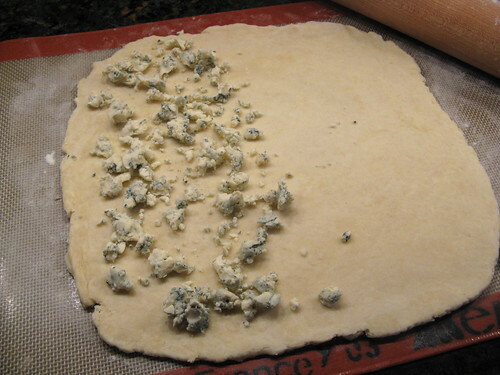 Fold the other half of the dough over the half with the cheese. Roll the dough back out to a square or shape need to cut your pastry tops. Use a sharp knife to cut the pastry to be about 1/2-inch bigger all around than the dish you will be making your pie in. Return the dough right on the surface you rolled it on to the refrigerator for a few minutes to stiffen up (if you make the mistake I did & remove the dough at this point it will stretch out & loss the shape you cut). Ladle the beef filling into 1 1/2 c ramekins (or just use one large one). Wet the edge of the ramekins. 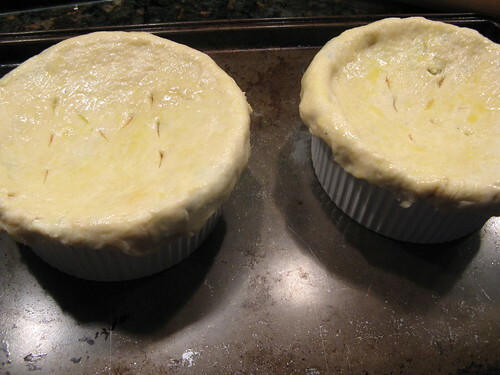 Lay the pastry dough over the top of the ramekins crimping to the edges to seal. Beat the egg with a little water & brush over the pastry dough. Use a knife to make a few slits in the dough. Place the ramekins on a baking sheet. Bake for 30 minutes or until the pastry is dark golden brown. Nice touch w/ the blue cheese...a hearty dish for the fall. Blue cheese really isn't my thing but Zach loves it so I really like that in this recipe it's totally optional and I could easily leave it out of my portion. This looks yummy! What could you use instead of beer? Oh My Ward. You had me at the title. Oh my goodness, Kat! That looks delicious! I think your version is most likely better than the WS version! Texas - You could use beer broth or stock instead of beer. The flavor might not be exactly the same but it would work. Talk about hooking me with a title! I am *so* making this. Soon. That looks delicious! Beer and blue cheese...what a great combination! How competely ingenious! Blue cheese baked inside the crust!!! I can't drink beer anymore due to my medication, but you better believe that we'll be making something like this very soon. This pie has it all! I love making pot pies and also agree that the crust is the best part. I eventually broke down and bought some shallow square pyrex dishes that hold 16 ounces, but are only about an inch deep. I think they are perfect for pot pies. 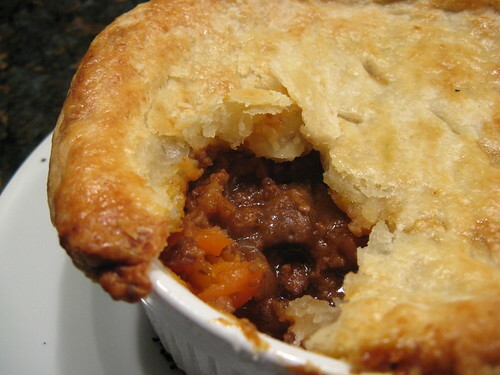 Most pot pies cook a little faster in these dishes as well. I love the idea of the cheese tucked into the crust. I will have to try it. Looks good! Beef and beer...my hubby would be in heaven! This looks delicious! 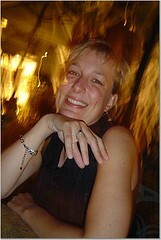 I'm saving your post and will try in the next few weeks. Wow, Kat.. this is totally awesom! Look at you getting innovative! Ha!!! I'm enamored with this dish. I want to copy this and make it when it gets cold. It was 93 degrees today. I won't be making this any time soon! Oh my - how delicious does this pie look - you should enter it at Kopiaste for her savoury pie roundup - it's guaranteed to be a popular submission. Ooh la la! This looks spectacular. I love, love the blue cheese in the pot pie. A pot pie with blue cheese, it does not get any better than this!!!! This is sooo one of my favourites - looks warmingly delicious! Blue cheese pastry? What an amazingly good idea! I'm swooning. Blue cheese makes me weak in the knees!